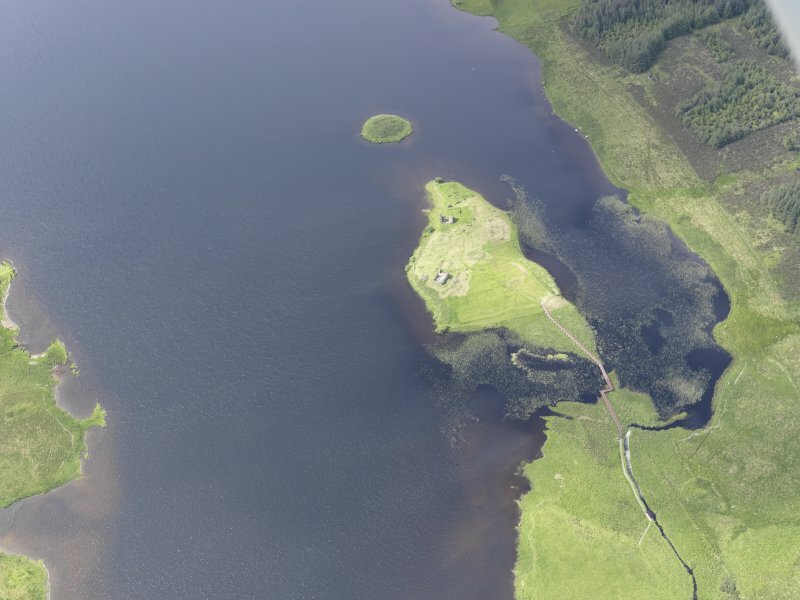 (NR 3876 6801) Remains of buildings were noted on the circular Eilean na Comhairle, traditionally regarded as the "council" island (associated with castle NR36NE 6, on Eilean Mor). 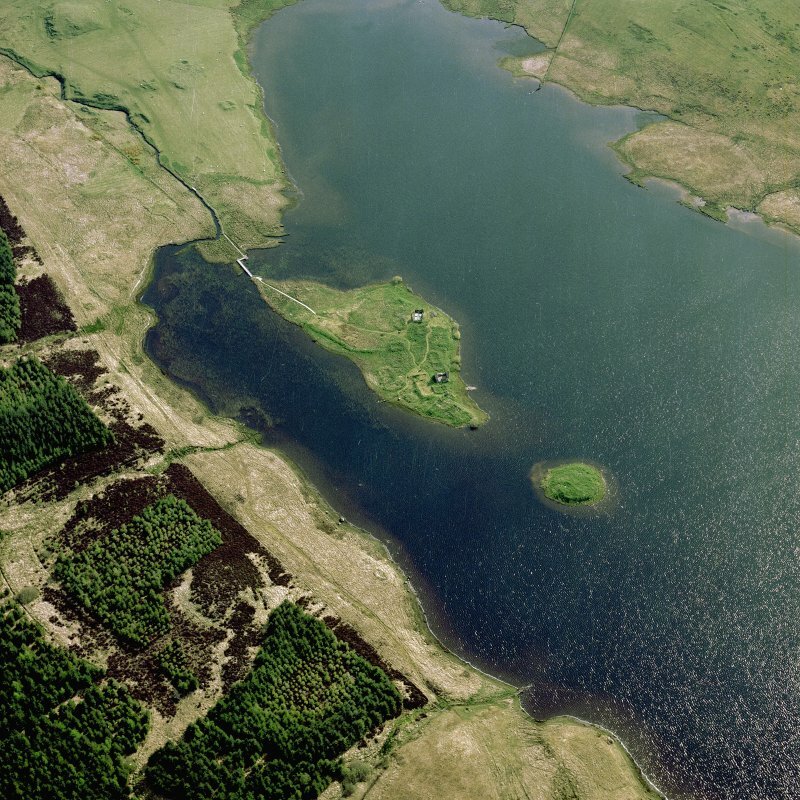 There is no evidence to suggest that Eilean n Comhairle is a crannog, nor any causeway from it to Eilean Mor. Three flint flakes were picked up on the shore, one had been artificially struck. 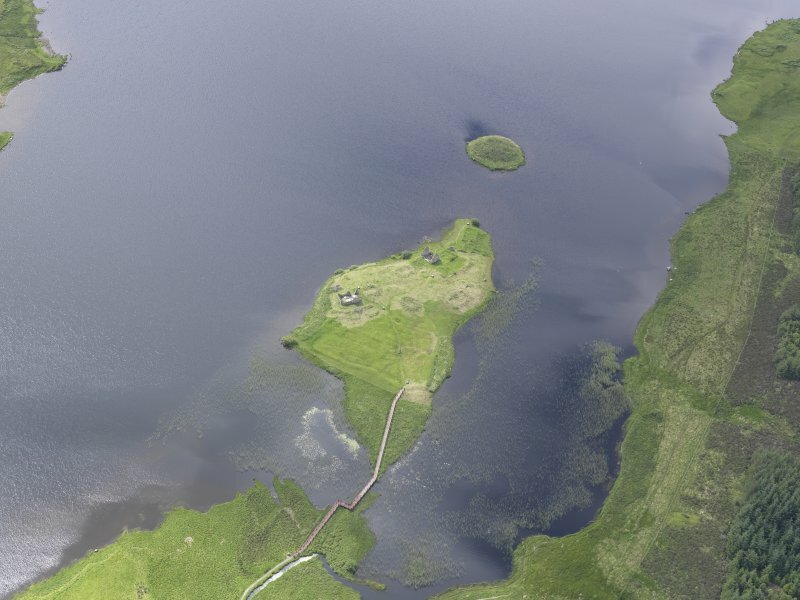 There are two building footings, turf-covered and measuring 7.5 by 5.0m and 9.0 by 5.0m on Eilean na Comhairle. 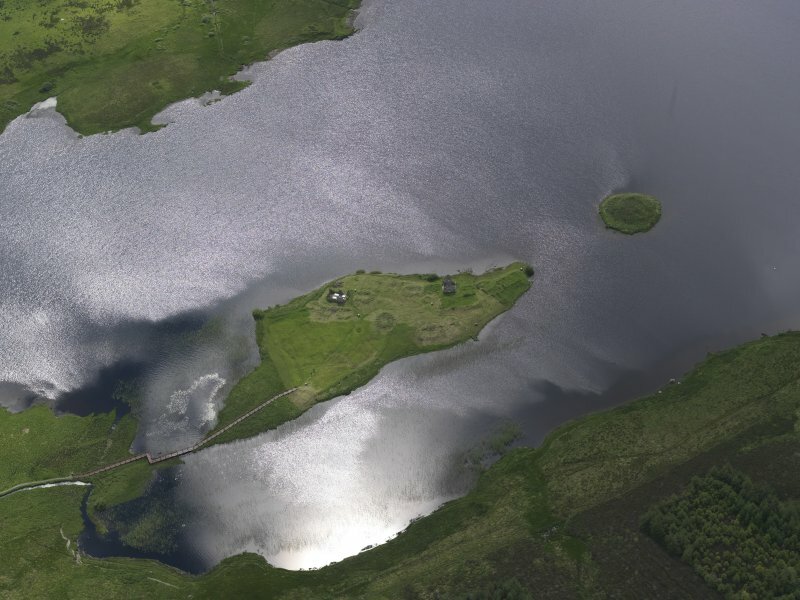 The island, from the old beach level, is 2.5m high and 27.0 by 22.0m on plan; it has a regular outline and shows medium stone at base, but overall is probably too high to be considered as a crannog. Stones protude above present water level from the opposing shore of Eilean Mor, but nothing else apparent that might indicate a causeway. 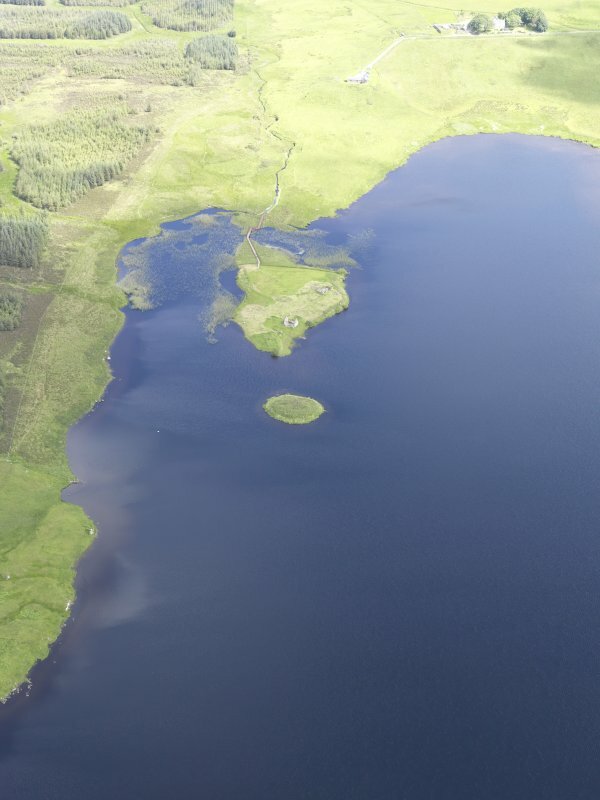 Eilean na Comhairle is circular, about 30m in diameter, and seperated from the top of Eilean Mor by a 50m-wide stretch of water, formerly crossed by a causeway. The island appears largely or totally to be of artificial construction. 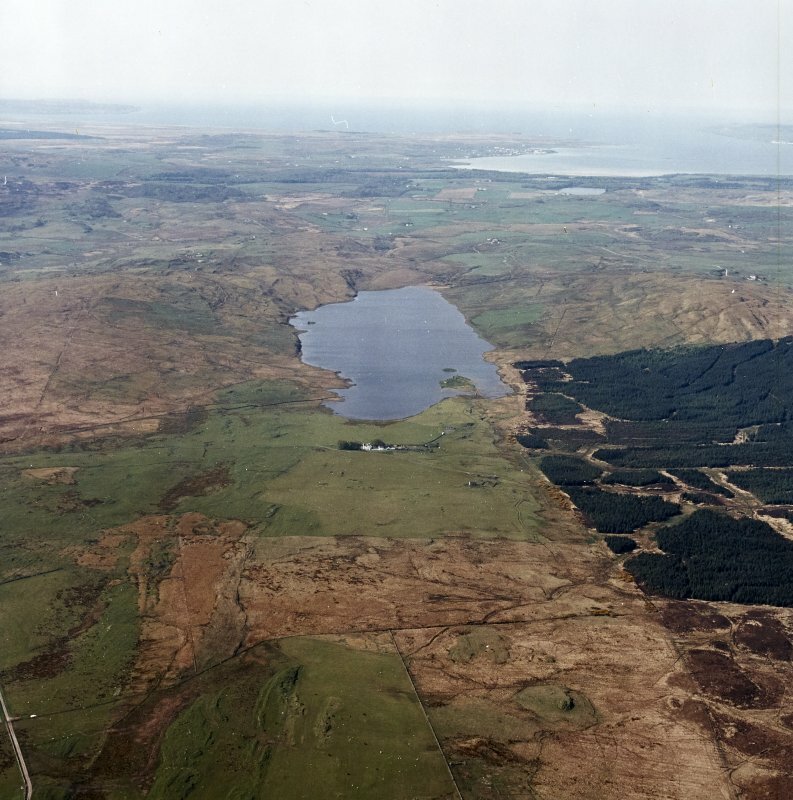 The RCAHMS survey traced three structures, buildings a, b and c. Trench 16 covered part of a and b and showed them to have clay-bonded stone walls. There was evidence of site clearance in in the 19th century. Building a was a sub-rectangular building, unicameral (contrary to the RCAHMS plan), with opposed doorways in its long walls and a central hearth. It was possibly a hall with building b serving as a private chamber. Both buildings sat over the flattened remains of a large structure with lime mortar walls 1.5m thick. This is tentatively identified as the remains of a small rectangular enclosure castle. The island effectively consists of its ruins, which appear to be the result of systematic dismantling and removal of stonework. 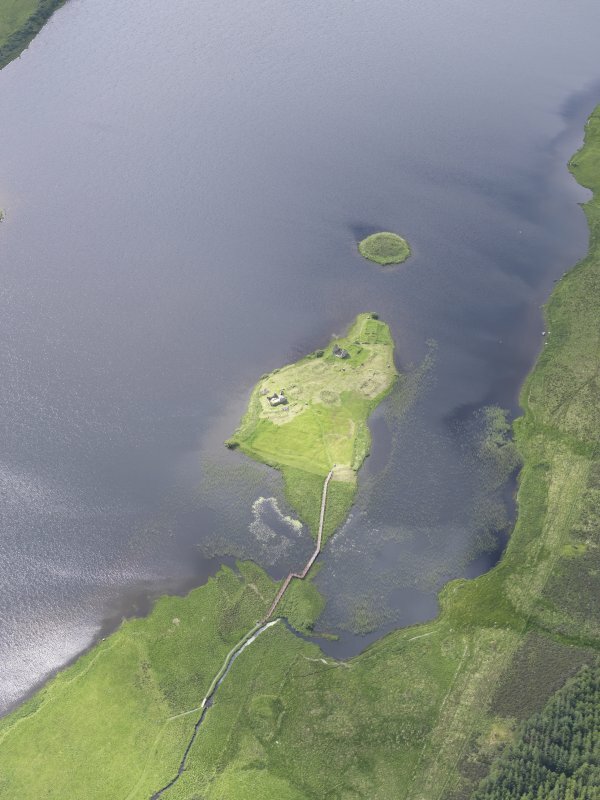 One of the main aims of continued excavation on Eilean na Comhairle was to define further the massive lime-mortared walls found in 1993, supposed to be the remains of a medieval castle. This may have been a hall-house, on the basis of the pottery, built in the 13th century. 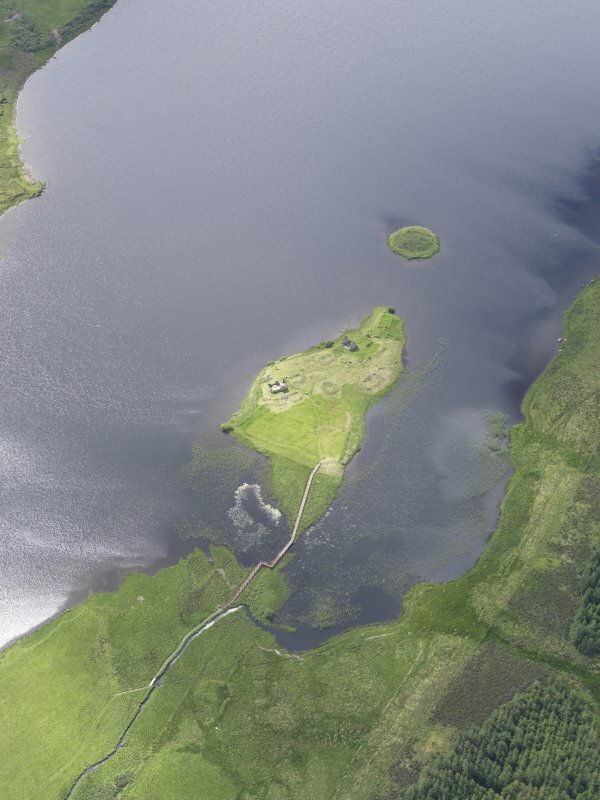 Building (a), planned by the RCAHMS, and overlying it, may have been the meeting place for the Council of the Isles. An archaeomagnetic determination from its hearth, provided by GeoQuest Associates, suggests that it was occupied in the 15th century and not the 16th as previously supposed. The walls of the castle were founded on rubble with numerous voids, retained around at least the S and W sides of the island by a thick drystone wall, evidently the remains of a dun or broch which forms the main mass of the island. Part of a cist or stone-lined box with deposits of cramp was viewed but not excavated. A polished stone axe was recovered nearby. 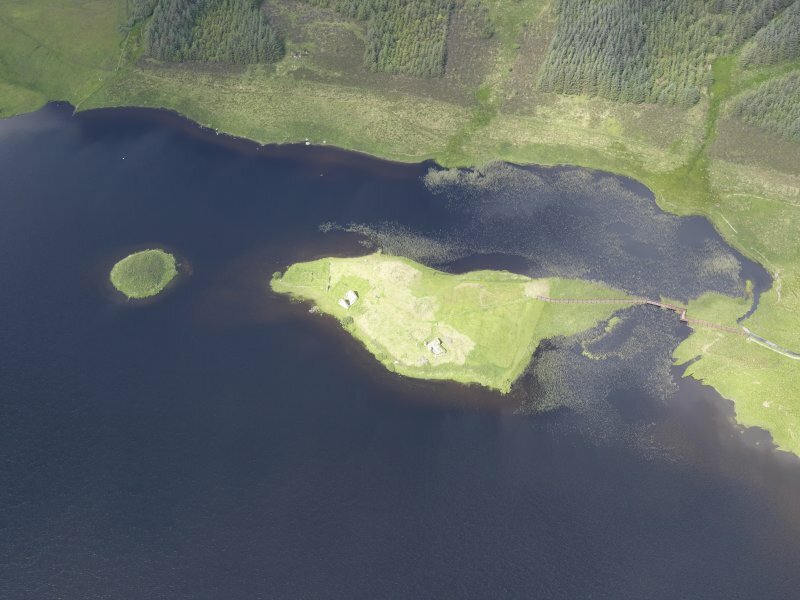 Limited work in June by The Scottish Trust for Underwater Archaeology demonstrated the presence of extensive midden deposits containing animal bone and medieval pottery on the side of the island adjacent to Eilean Mor. From the shore of the island at this point was recovered a 14th-century Roman pilgrim's badge. 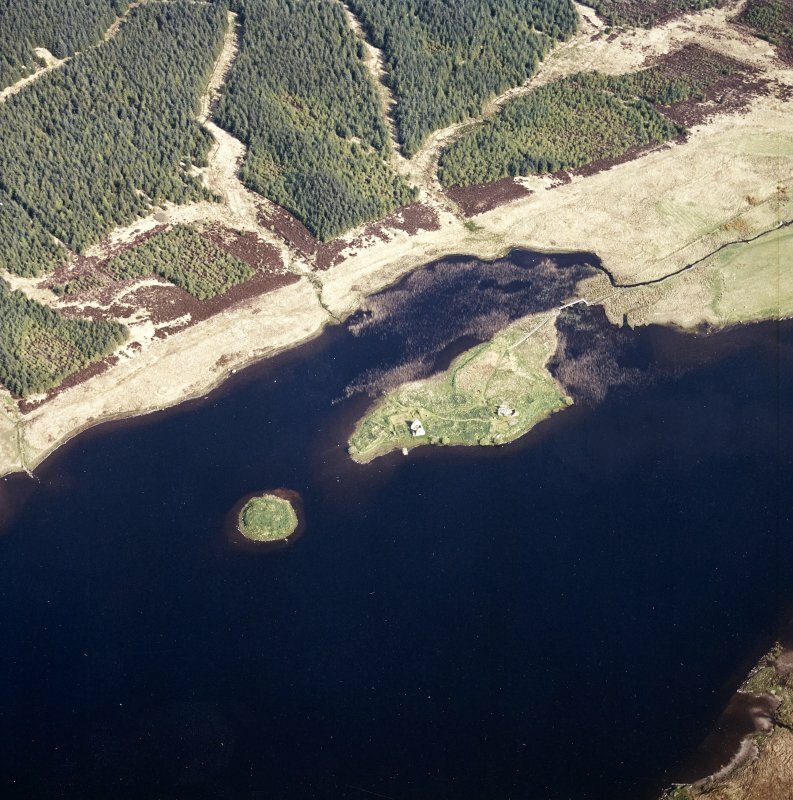 NR 3878 6802 In 1994 limited reconnaissance work by the Scottish Trust for Underwater Archaeology demonstrated the presence of medieval midden deposits on the side of the island adjacent to Eilean Mor. 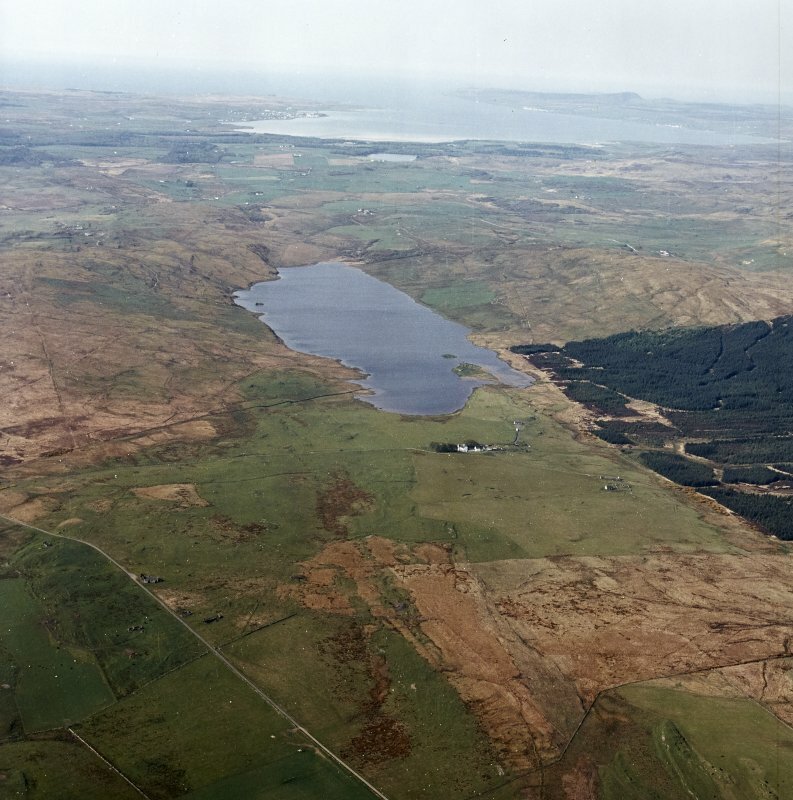 In 1997 it was possible to sample these, thanks to the co-operation of the Army, particularly the Edinburgh OTC, in building a dam and pumping the water out from an area of about 80m2. It is estimated that the midden may spread over a total area of about 400m2. Refuse may have settled here because this side of the island is sheltered. The causeway to Eilean Mor, and possibly a jetty, may have helped to trap it. The midden is sealed by gravel and iron pan. From the gravel have been recovered medieval artefacts, perhaps mostly eroded from the island edge. They include two short cross pennies of the first half of the 13th century. The midden was sampled in a number of small test-pits. It had an organic, sandy, fibrous matrix, packed with considerable quantities of animal bone, hazelnut shells, and pieces of wood, including round wood, twigs and offcuts of worked timber. Sherds of pottery, leather shoes and a broken stone mortar confirm its medieval (?12th-13th century) date. This deposit had a maximum depth of 400mm before giving on to a layer of blocks and boulders, in which were two empty post-settings. Excavation to deeper levels was limited but showed that the stones sealed another organic-rich deposit, similar to the upper one, but with noticeably greater quantities of wood, especially withies, and pieces of peat. There was no apparent structure to this but the stubs of three birch stakes were encountered in situ. This woodwork, with the overlying stone layer, probably represents the remains of an artificial platform, the date of which has still to be established. 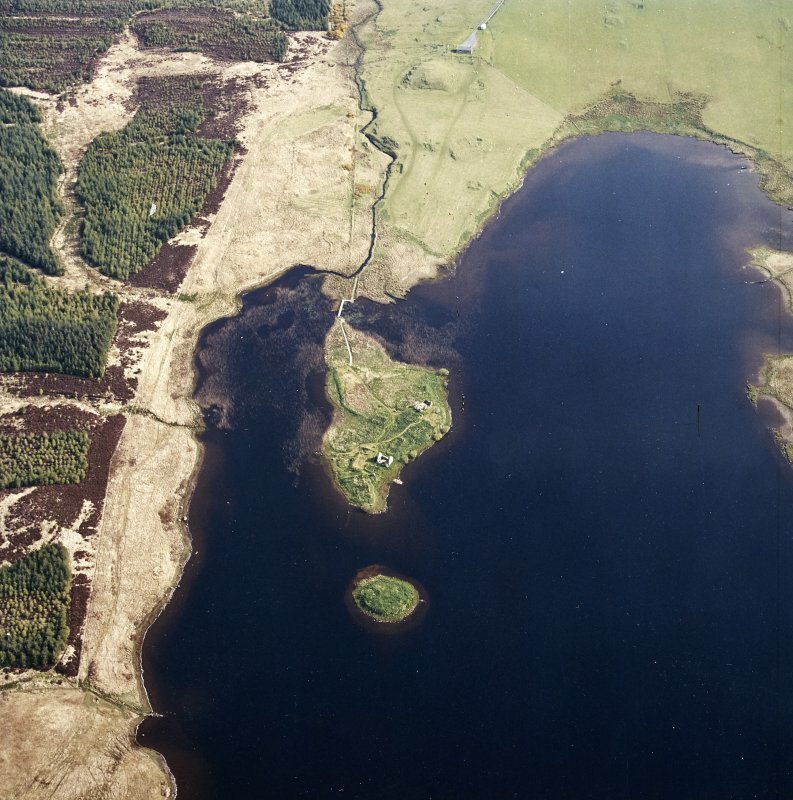 An earlier artificial platform was represented by an underlying sequence of stone layer, midden and wood-rich organic deposit, resting on the bottom of the loch. A thorough programme of wet sieving, flotation and taking of samples for other environmental work was undertaken.